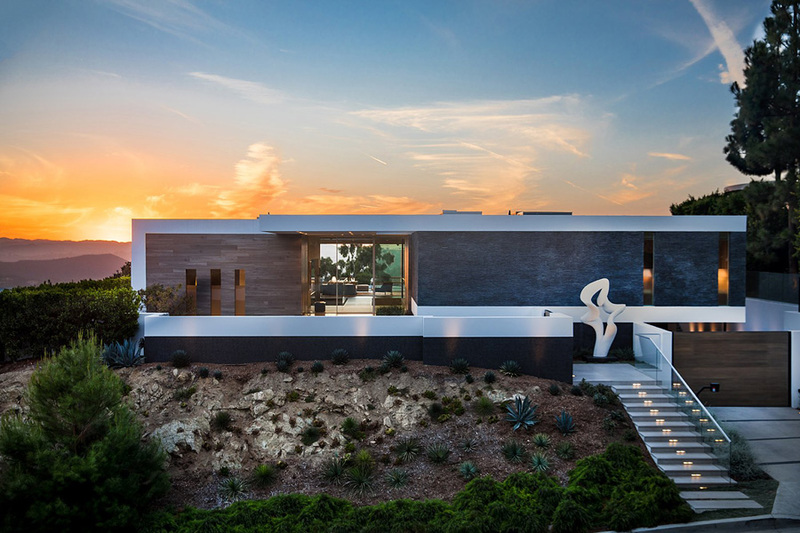 Whipple Russell Architects has designed a new house in Beverly Hills, California, that has sweeping views of the surrounding landscape. 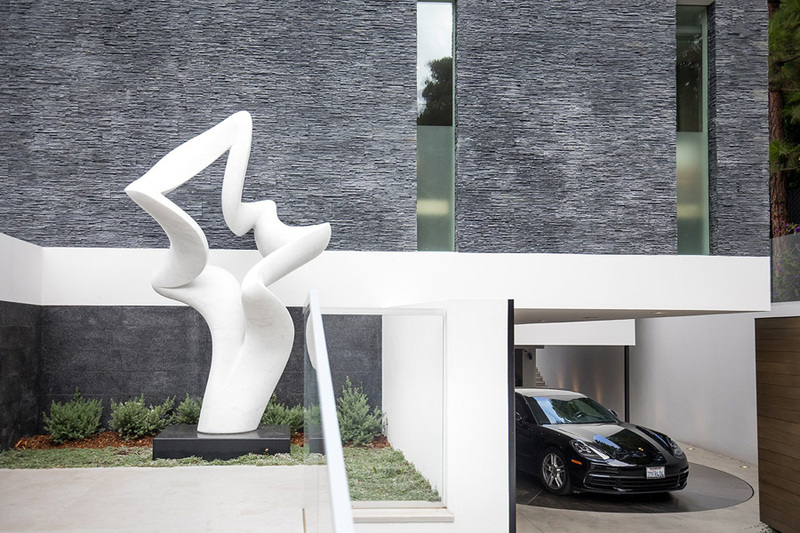 Guests coming up the front steps of this hilltop home are met with a Carrera marble sculpture by Richard Erdman, while the car park features a turntable that identifies each car, rotates it to a preset angle, enabling the driver to exit with ease. 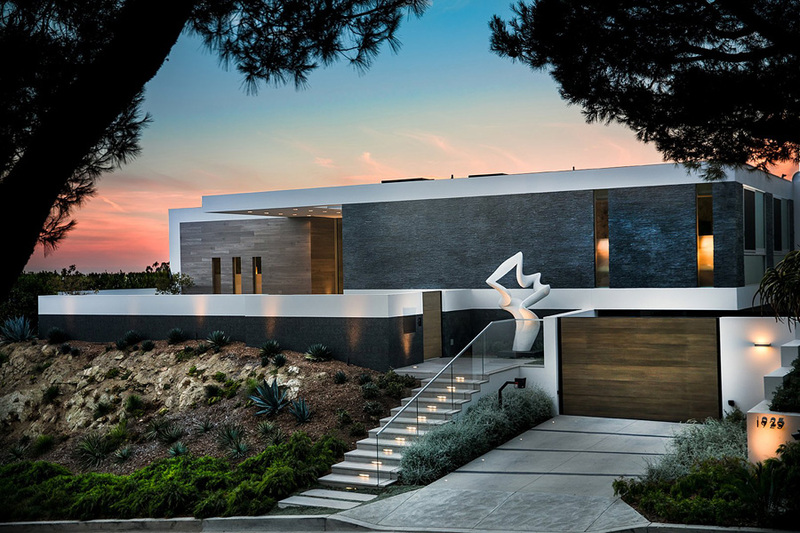 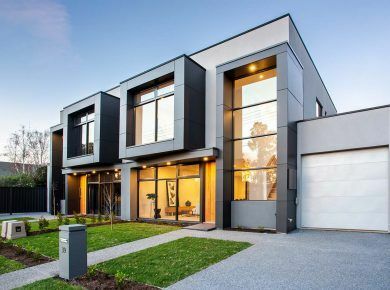 The dark-grey rough stacked-slate exterior of the house is capped with crisply contrasting white stucco, and a pivot-style all-glass front door and surround welcomes guests to the home. 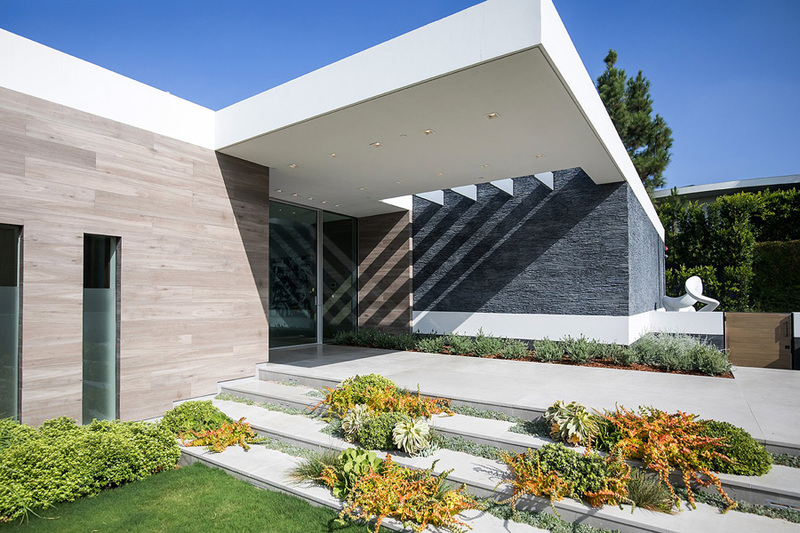 Inside, the central open volume topped by a skylight is Marc Whipple’s modern take on the traditional courtyard. 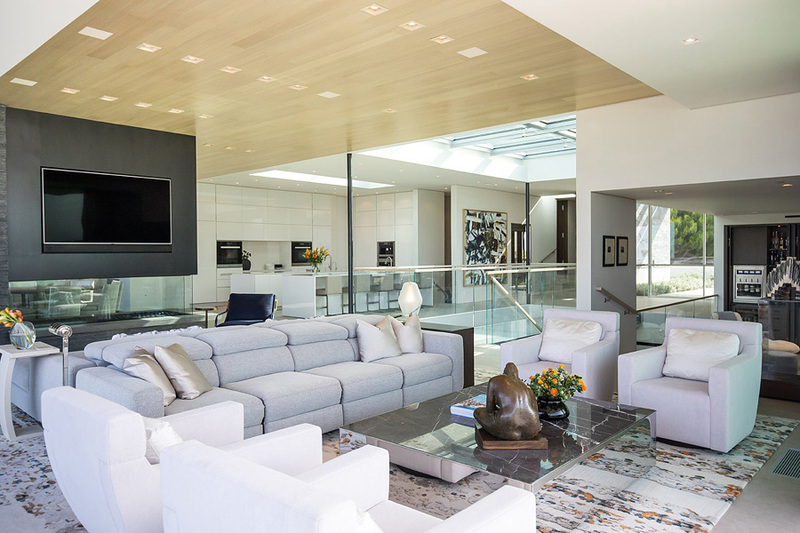 He took the courtyard, and sunk it so that all the below-grade rooms open off of it, transforming what normally would be a dark basement into a lower floor with light and views. 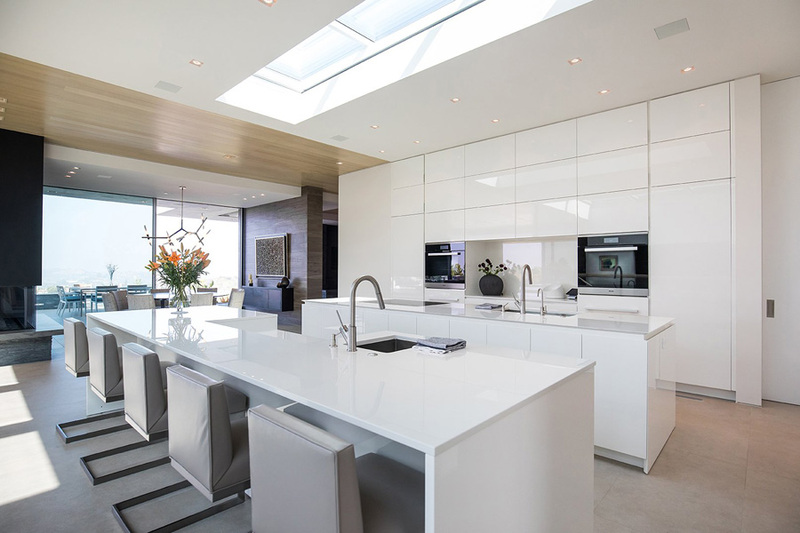 The large skylight pulls the dramatic focus upwards as well, so this vertical volume contains both dynamics seen while crossing the glass bridge. 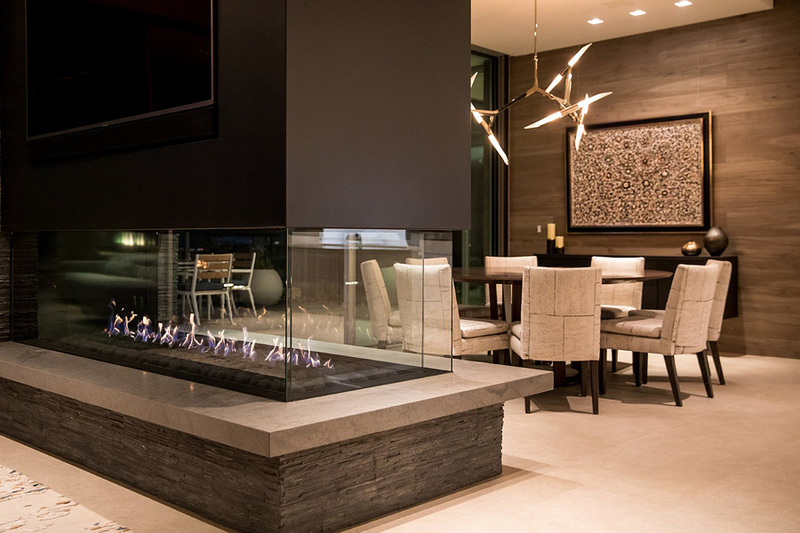 The architects worked together with interior design firm McCormick and Wright, to create a luxurious and modern atmosphere. 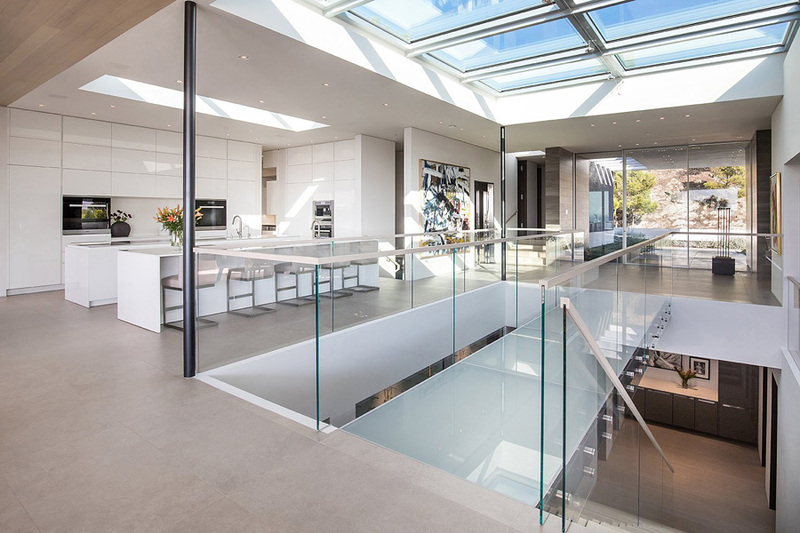 Surrounding this sunny atrium are the kitchen, living, and dining areas. 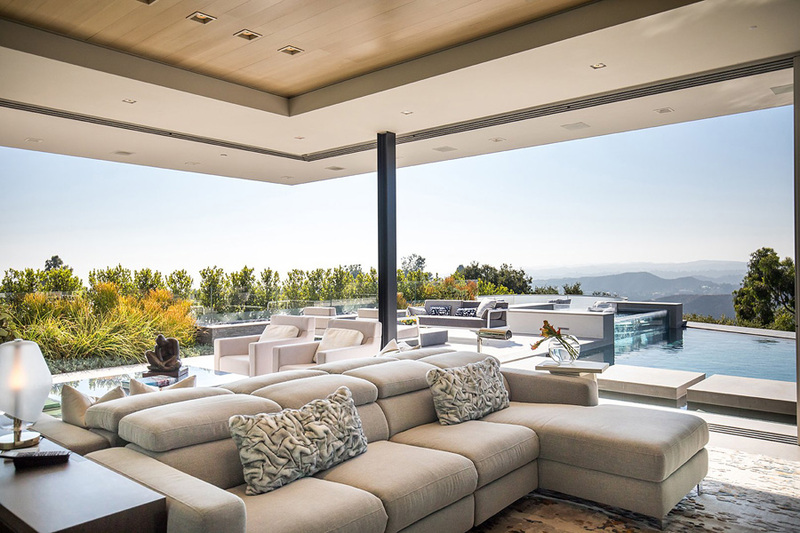 In the living room, a back-to-back lounge arrangement ensures that the fireplace and the views can both be enjoyed. 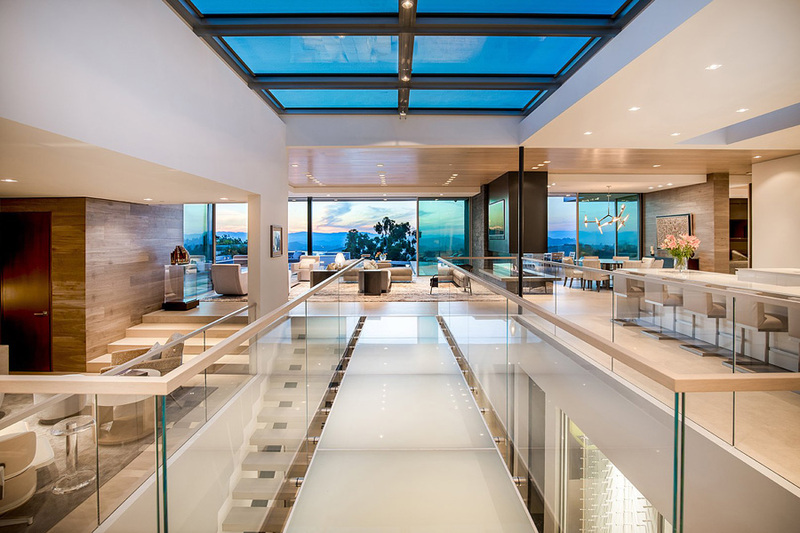 At the back of the house two walls of glass glide open to provide easy access to the pool and patio entertaining spaces. 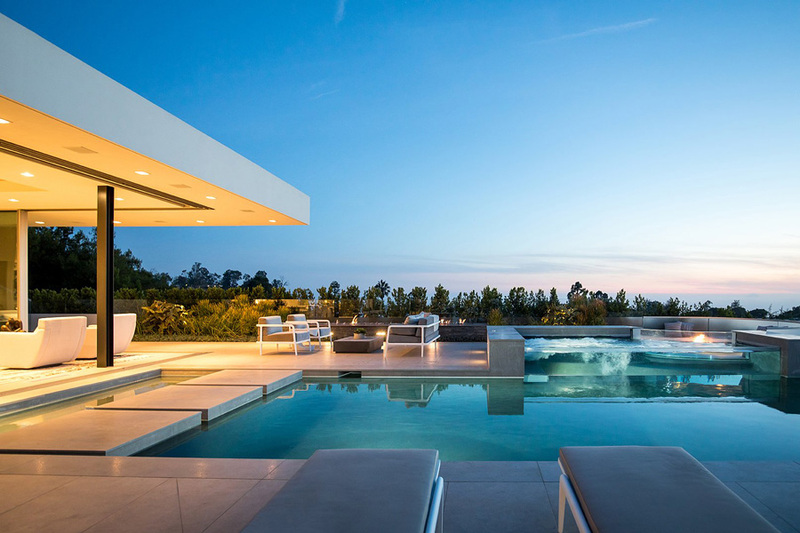 And be sure to check 12 world’s most extraordinary pools. 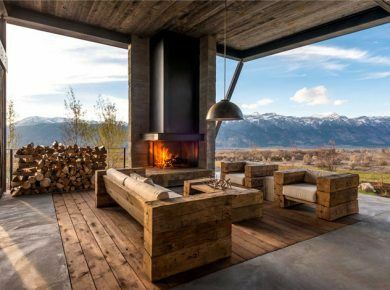 The property extends out in a V-shape towards the view; at the far point is a large built-in seating circle around a fire pit for gathering with friends. 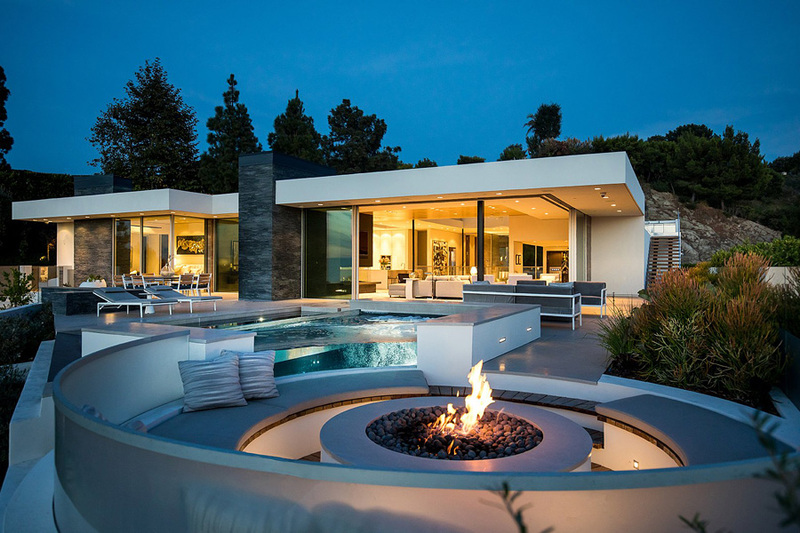 The acrylic wall between the spa and pool, pedestal walkways across the water, and specialty lighting, were additions that brought an extra interest and style to the outdoor living space. 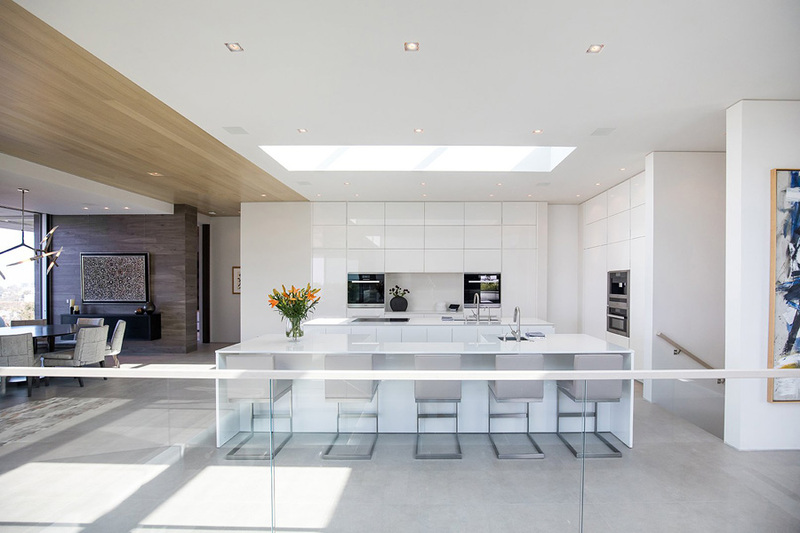 Back inside, and there’s sleek all-white kitchen islands and floor-to-ceiling cabinets that are minimalist in their design, with a skylight adding even more light to the bright space. 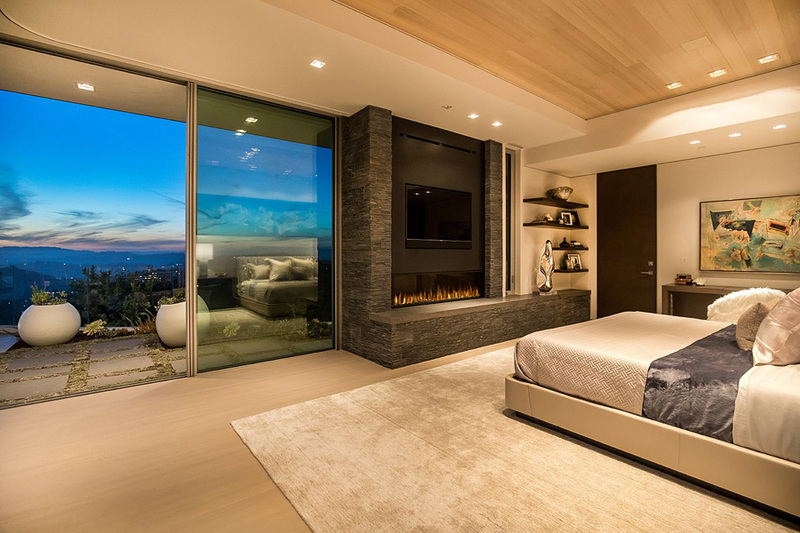 In the master suite, there’s a painting above the bed by James Nares, and opposite the bed is a fireplace, that sits beside sliding glass doors that open to the back patio. 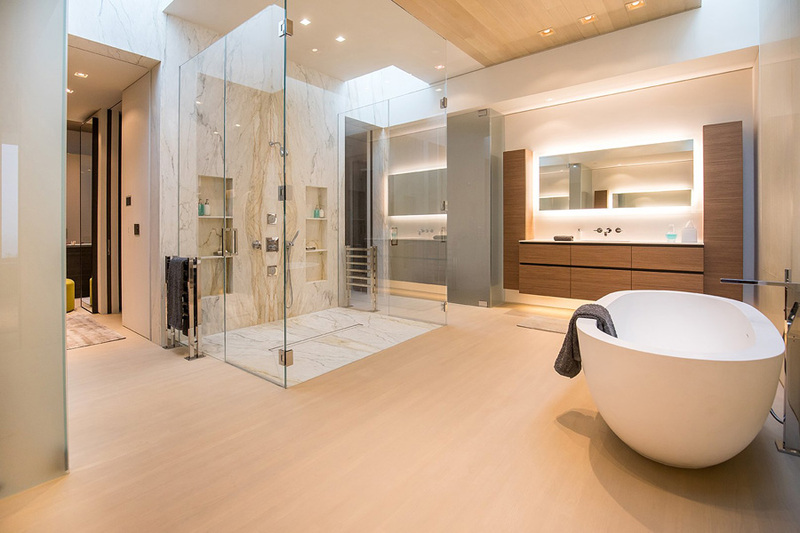 In the master bathroom, there’s a large walk-in shower with a glass surround, while sitting adjacent to the shower is a freestanding bathtub, and a vanity with a back-lit mirror. 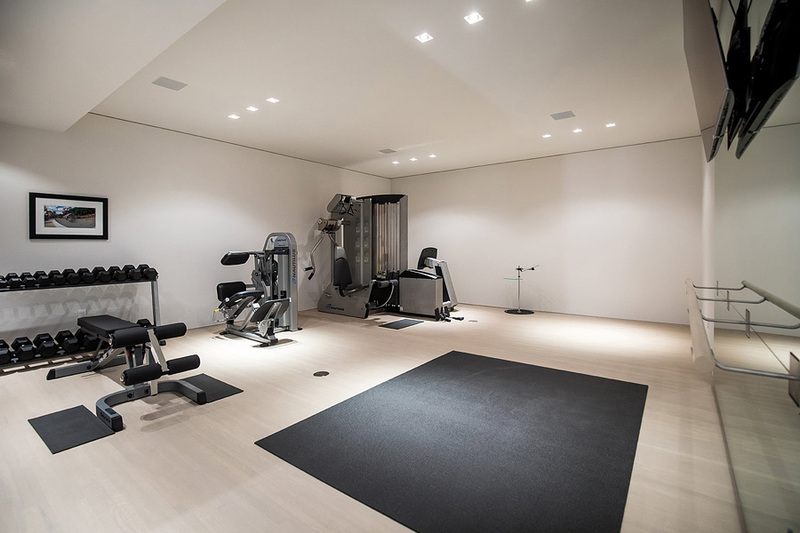 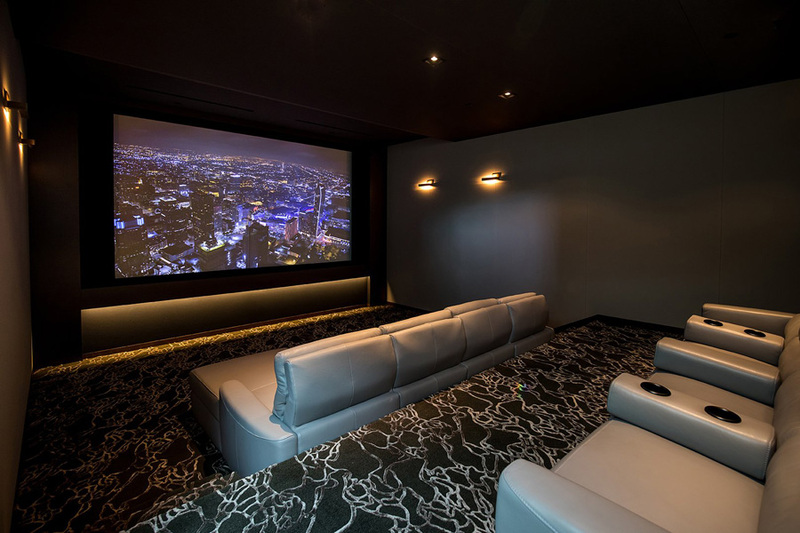 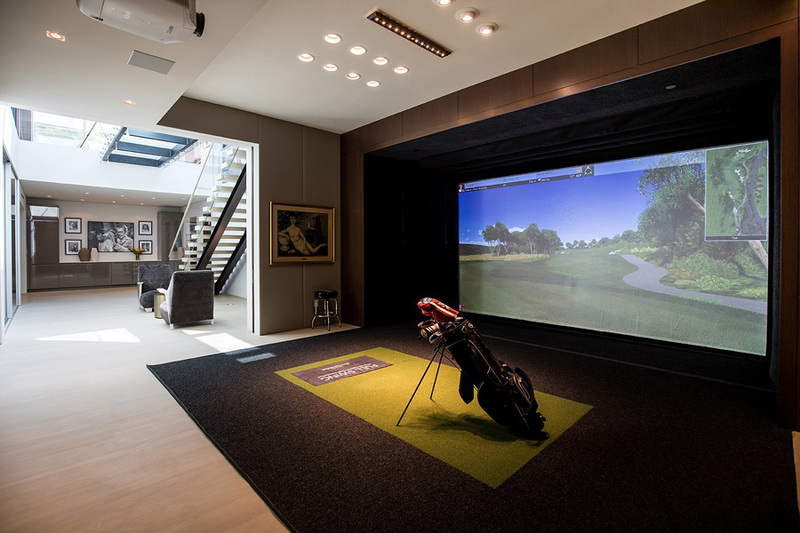 The surrounding rooms that are accessed via the small seating area include a full gym and weight room, a salon with massage table and full bath with steam shower, a golf simulator, and an 8-seat home theater.